Ah-choo! 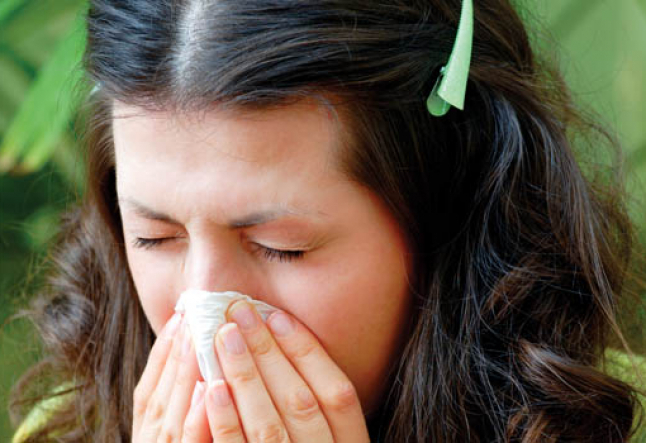 Itchy eyes, running nose, that nagging cough that won’t go away—sounds like it’s allergy time again. You can see and feel the effects of your immune system’s response but what is happening “behind the scenes”? To begin with, your immune system (think of it as the general directing the troops) sends an order to the lymphatic system, which in turn produces antibodies whose job it is to bind to receptors on specific cell types. Once locked in place, “weapons production” begins: quantities of inflammatory chemicals – interleukins, leukotrienes, and histamine—are generated, resulting in the typical allergic reaction: itchy, watering eyes, coughing, muscle spasm or nerve pain, and, in severe cases, falling blood pressure and difficulty in breathing. In some cases, you might even suffer chronic effects, such as fibrosis (excess fibrous connective tissue in an organ or tissue), hyperplasia (increase in the number of the cells of an organ or tissue causing it to increase in size) or polyp formation (smooth-coated abnormal growth projecting from a mucous membrane). But whether chronic or acute, the result of an allergy attack is a level of discomfort that sends you searching for something to quell the symptoms. Most doctors prescribe antihistamines, which reduce or eliminate the effect of histamine release. Other drugs include corticosteroids (often used for skin-related responses), sympathomimetics such as adrenaline (or epinephrine) that help open bronchial airways, and other medications. Unfortunately, while they do their job fighting the allergic response, they all have significant side effects which can make the cure almost as damaging as the disease. OPCs take a two-pronged approach to combating immune system dysfunction. First, it hits the histamine production line by preventing the histadine enzyme from attaching to collagen tissue, which keeps it from turning into histamine. , , ) Then it goes after the IgE (immunoglobulin E) antibodies, keeping them from connecting with mast cells (loaded with histamine) , thereby slowing the histamine release —all of which means a lessening of the symptoms which means less reaction and discomfort for you. OPCs are found mainly in the parts of foods that are removed and discarded before serving or eating (grape seeds, peanut skins or lemon peels) as well as in extracts from unripe apples, pine bark, green tea, Ginko biloba and many other plants. Given the difficulty in acquiring adequate amounts of OPCs from food sources alone along with the variations in production, harvesting and refining (which affects the overall quality of the OPCs), a wiser choice would be to rely on supplements containing OPCs. This will not only help improve your immune system function but also combat allergic reactions without all those annoying prescription-generated side effects.